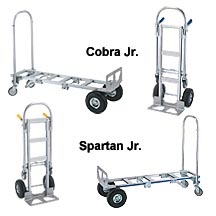 Spartan Economy 2 in 1 Truck...Foot pedal release allows easy conversion from 2-wheel to 4-wheel position. 18"W. noseplate for large, bulky loads. Shipped KD in a box. Product No. Wt. Cap. (lbs.) 2 Wheels/4 Wheels Wheel Description Frame Bed W x H Wt. (lbs.) Price Ea.